By Steve S. Ryan, PhD. This post was originally published July 15, 2016. 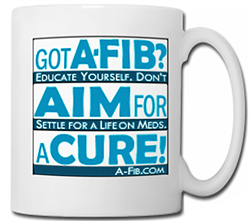 Note: Use the A-Fib.com Amazon portal link and your purchases help support A-Fib.com (http://tinyurl.com/Shop-Amazon-for-A-Fib). 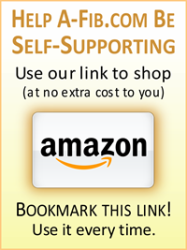 Learn more at: Use our Portal Link When you Shop at Amazon.com. Click image to read Steve Ryan’s personal experience story. The mineral Magnesium (Mg) is needed for proper muscle (including the heart), nerve, and enzyme function. A deficiency in Magnesium (along with potassium) can cause palpitations and force the heart into fatal arrhythmias including Atrial Fibrillation. Magnesium (Mg) is one of the main components of heart cell functioning, but is chronically lacking in most diets. Magnesium deficiencies in general populations range from 65% to 80%, creating a substantial cumulative deficiency over months and years. A deficiency in magnesium (along with potassium) can force the heart into fatal arrhythmias including Atrial Fibrillation. Magnesium used to be plentiful in fruits, vegetable and grains, but decades of industrial-scale farming have stripped the soil of minerals like magnesium. One study found that the nutrient content of crops has declined by as much as 40% since the 1950s. In addition, we no longer absorb magnesium by bathing in or drinking natural mineral-rich water that is high in magnesium—instead, we’re drinking and bathing in tap water that’s devoid of magnesium. So it’s now almost impossible for A-Fib patients to get adequate amounts of Magnesium from a healthy diet. To correct a severe Magnesium deficiency and restore levels, it’s often necessary to take a Magnesium supplement over several months. Confused by the various forms of Magnesium supplements? There are so many different types. Sadly, many of the available magnesium supplements aren’t even absorbable by your digestive tract and will not do anything beneficial for your health. And a low-quality magnesium supplement can cause diarrhea. Fortunately for A-Fib patients, there are many magnesium forms that are absorbed well by your body. • Magnesium Glycinate: (such as Doctor’s Best High Absorption Magnesium Glycinate Lysinate 100% Chelated). One of the most commonly used form of magnesium is both highly absorbed, inexpensive, and easy to use. Magnesium glycinate is absorbed in a different part of the gut compared to other magnesium types, so it’s a good option if other supplements give you digestive stress. • Magnesium Gluconate: Has very good absorption rate; a good alternative if you have had digestive trouble with other types of magnesium supplements. • Magnesium Threonate: (such as Life Extension Neuro-Mag Magnesium L-Threonate). Magnesium threonate is a newer form of Magnesium supplement that can penetrate the blood-brain barrier with potentially neuroprotective effects against Alzheimer’s disease. Pricier but doesn’t have the laxative effect. Contains very low elemental magnesium per dose which suggests it would not be a good choice for correcting a magnesium deficiency. • Sublingual Angstrom Magnesium: (such as Mother Earth Minerals Angstrom Minerals, Magnesium-8 ozs.) A quickly absorbed liquid that’s 99% pure Magnesium, it’s applied under the tongue, then after one minute, swallowed. Angstrom Magnesium has the best magnesium absorption and generally the fewest digestive side effects. It’s especially good for those who are severely magnesium deficient and need a lot of magnesium in order to replenish their levels. • Magnesium Chloride flakes: (such as Ancient Minerals Magnesium Bath Flakes of Pure Chloride). Similar to Epsom salts (Magnesium sulfate), the molecular structure of Magnesium Chloride is different and is much more easily absorbed into the body. Add Magnesium Chloride flakes to a weekly soaking bath or a foot bath. Can be used in conjunction with magnesium tablets. • Magnesium Oil: (such as Ancient Minerals Magnesium Oil Spray – Magnesium Chloride). Apply Magnesium oil once a day to arms or legs; after 20-30 minutes, wash off. Can be used in conjunction with magnesium tablets. Some oral forms of magnesium (often cheap) offer relatively low bioavailability (the degree and rate at which it enters the body’s circulatory system). These forms of magnesium do not absorb well and tend to offer little benefit beyond laxative or antacid properties. When super-loading to replenish your Magnesium, it’s best to avoid Magnesium oxide, Magnesium dihydroxide (milk of magnesia), Magnesium sulfate, Magnesium aspartate, and Magnesium carbonate. In particular, be sure to avoid any supplement containing magnesium stearate, a common but potentially hazardous additive. There are many forms and brands of magnesium supplements. Before you buy, be sure to check the label to ensure they only contain the one type of magnesium and no fillers. Proper levels of Magnesium can improve by 34% your chances of living a long, healthy life! It’s critically important to purchase from a source that tests every batch to ensure you are getting what is on the label and nothing else, like unwanted toxins, allergens, and heavy metals. Look for brands of magnesium that are pharmaceutical grade and adhere to Good Manufacturing Practice (GMP), a system for ensuring that products are consistently produced and controlled according to quality standards. This means they are produced in strictly monitored facilities which also send batches of their product to third parties for analysis before selling to consumers (such as Nature Made). As an A-Fib patient, you may have a severe Magnesium deficiency. To restore your level, it is often necessary to take a Magnesium supplement over several months. We recommend the following when you are “super-loading Magnesium”. Magnesium supplements should always be taken daily with a meal or just after eating. • Oral: Magnesium glycinate is thought to be the best type of oral supplement when correcting a severe magnesium deficiency. • Sublingual: Angstrom Magnesium is 99% pure Magnesium that’s applied under the tongue. Especially good for those who are severely magnesium deficient. • Topical: Magnesium oil and Magnesium chloride salts (flakes). These are absorbed directly through the skin and by-pass the gastrointestinal (GI) tract, so they can be used in conjunction with magnesium tablets. If sensitive to bowel problems, they can be used as an alternative to Magnesium tablets. Keep in Mind: Everyone’s body reacts differently to supplements. Just because a form of Magnesium is best for one person, doesn’t mean it’s the best for YOU. To learn more about Magnesium, see Cardiovascular Benefits of Magnesium: Insights for Atrial Fibrillation Patients. Magnesium is a mineral involved in many processes in the body including normal muscle contraction (including the heart), nerve signaling and the building of healthy bones. About 350 enzymes are known to depend on magnesium. Magnesium is needed for proper muscle, nerve, and enzyme function. At least 80% of Americans are deficient in Magnesium (Mg). Other Western countries today exhibit similar deficiencies. This creates a substantial cumulative deficiency over months and years. A deficiency in magnesium can force the heart into fatal arrhythmias and is central to creating conditions in the heart that cause Atrial Fibrillation. A-Fib patients, in particular, are often significantly deficient in magnesium. A normal healthy diet rarely meets your need for magnesium. Therefore, it’s often necessary to take a magnesium supplement over several months to restore levels. Why are so many of us deficient in Magnesium? Magnesium used to be plentiful in fruits, vegetable and grains, but decades of industrial-scale farming have stripped the soil of minerals like magnesium. One study found that the nutrient content of crops has declined by as much as 40% since the 1950s. It’s now almost impossible to get adequate amounts of magnesium from food. We’re not drinking spring or mineral water that’s high in magnesium—instead, we’re drinking tap water that’s devoid of magnesium. As a result, we ingest even less magnesium. Add to that, we’re no longer bathing in natural water that is high in magnesium. Our skin can absorb magnesium from our bathing water—which is now missing. Prescription drugs can lower our magnesium levels, as can the stress of our modern lifestyles. Over the years, this has caused a magnesium deficient population, especially critical for those with Atrial Fibrillation or other heart ailments. • Cardiovascular Benefits of Magnesium: Insights for Atrial Fibrillation Patients. Then, take a look at this video with Dr. Carolyn Dean, author of The Magnesium Miracle. For those with magnesium deficient diets, getting nutrients through food is not always possible. Dr. Carolyn Dean, author of The Magnesium Miracle, talks about the external use of magnesium oil and Epson salts and the various powder and tablets to supplement magnesium. She covers the side effects of too much Mg, and how you can tell if you have a Mg deficiency. (3:39 min.) From iHealthTube.com. Go to video. • Goodman, Dennis. This Mineral Prevents Headaches, Heart Disease, More. Bottom Line Personal. Volume 35, Number 2, January 15, 2014. • Galan P. Dietary magnesium intake in French adult population. In: Theophile T, Anastassopoulou J. Magnesium: current status and new developments: theoretical, biological, and medical aspects. Dordrecht: Kluwer Academic; 1997. When you have A-Fib, a sensible starting point may be to check for chemical imbalances or deficiencies. A deficiency in minerals like magnesium or potassium can force the heart into fatal arrhythmias. If you haven’t recently read our Mineral Deficiencies page under Treatments, you might want to review it. We’ve updated and added some new content. For each we describe the mineral’s role and function in our body. Then, we cover how to test for deficiency (or overload). We describe the food or natural sources, then the various forms and choices of each supplement and recommended dosages. You’ll find the topics to discuss with your doctors including recommended tests and alternative choices. All backed up with our usual well researched citations. Go to our Mineral Deficiencies page. In our search for unbiased information sources about vitamins and mineral supplements, we looked at many, many informational directories. Three searchable databases rose to the top of our list. See Our Top 3 Sources for Reliable, Unbiased Info on Vitamins and Supplements. How Can I Avoid Arterial Calcium Deposits When Taking Coumadin? Holly Hannula wrote me about being on Coumadin (warfarin) for 12 years because she has a mechanical heart valve. She’s alarmed by a recent scan of her artery walls showing dangerously high calcium deposits, i.e. the amount of hardening of the arteries (atherosclerosis). Holly’s doctors recommended an angiogram (X-ray) and stents to be put in wherever needed and done very soon. She felt that was too drastic, that her quality of life was good and she was active and social. She and her husband declined those procedures. Holly’s coronary artery calcium score is 800 which is dangerously high. A score over 1,000 equals a 20% chance of a serious or fatal cardiac event within one year. No wonder Holly is worried! Because she has a mechanical heart valve, Holly doesn’t have a lot of options. Treatment Guidelines by the American College of Cardiology/American Heart Association (ACC/AHA) only include warfarin (Vitamin K Antagonist) therapy and perhaps aspirin. None of the newer anticoagulants are included. My Best Effort for Holly: In my return email, I promised Holly that I would get in touch with Bristol-Myers Squibb, the maker of Eliquis, to see if it could possibly be used in her case. It’s tragic that Holly has such extensive calcium deposits due to having to take warfarin (Coumadin) which works by blocking Vitamin K.
Vitamin K is essential for heart and bone health. Without enough K-2, osteocalcin, a protein that binds calcium to bone, doesn’t function. Instead the calcium ends up clogging arteries. See Arterial Calcification From Warfarin: Vitamin K May Reverse it. What’s equally tragic is how few doctors and their patients are aware of this side effect of taking warfarin (Coumadin). Vitamin K2 Reverses Arterial Calcification! But what K2 MK-7 dosage should Holly consider? We don’t have enough human research yet to give a definitive answer, but we do have some indications. Animal research: In an animal study, rats were initially fed a six-week diet of warfarin to induce calcium buildup in blood vessels. Some rats were then fed high dose Vitamin K1 or K2 (MK-4) for six weeks. They not only had no further arterial calcium accumulation but, more importantly, had a 37% reduction of previously accumulated arterial calcification. After 12 weeks, there was an astounding 53% reduction. Mega dose or RDA? In the above study of rats, the human equivalent of the vitamin K2 dose is in the range of 52,000 mcg (52 mg) to 97,000 mcg (97 mg) per day. Admittedly, these are high doses compared to the standard daily recommend dosages (90 mcg [0.09 mg] for females and 120 mcg [0.12 mg] for males). Already approved: In Japan, a 45,000 mcg (45 mg) daily dose of the MK-4 form of vitamin K2 is approved as a drug to treat osteoporosis. Forms of Vitamin K: Consider a high quality MK-7 form of Vitamin K2. Plus, as they are inexpensive, include vitamin K1 and MK-4 to help inhibit and possibly reverse vascular calcification. Remember to always take your Vitamin K supplement with fatty foods since it is fat-soluble and won’t be absorbed without it. Although the exact dosage of Vitamin K is yet to be determined, one of the world’s top Vitamin K researchers, Dr. Cees Vermeer recommends between 45 mcg and 185 mcg daily for normally healthy adults. LifeExtension magazine recommends 180 mcg. To reverse or reduce calcium plaque, you might consider the ultra high doses of 45-50 mg (45,000 mcg) daily, which is based on the research with rats. But only under your doctor’s supervision! It’s most important that Holly should NOT make any changes to her treatment plan without consulting with her doctor first. You need not worry about overdosing on K2—people who have been given a thousand-fold increase over the recommended dose over the course of three years have shown no adverse reactions (i.e. no increased clotting tendencies). If you are taking warfarin, your goal should be to maintain the highest healthy levels of Vitamin K to counteract the effects of warfarin on your arterial and bone health. If you change from warfarin to a NOAC, your goal should be to restore your arterial and bone health from the effects of warfarin by maintaining the highest healthy levels of Vitamin K.
Additional reading about Vitamin K To learn more about the types of Vitamin K, see our article, Vitamin K―Protection Against Arterial Calcification & Cardiovascular Disease. On a personal note: I’ve had a CT scan which revealed calcium deposits in my heart’s arteries, especially in the “widow maker”, the Left Anterior Descending artery (LAD). After writing this article, I’ve decided to take 45 mg (45,000 mcg) of Vitamin K2 daily. 11-100 Definite, at least mild atherosclerotic plaque. Mild or minimal coronary narrowings likely. > 400 Extensive atherosclerotic plaque. High likelihood of at least one significant coronary narrowing. • Goodman, Denonis. The New Nutrient Fix. Bottom Line/Health. July, 2015, p. 3. • Geleijnse, JM et al. Dietary Intake of Menaquinone Is Associated with a Reduced Risk of Coronary Heart Disease: The Rotterdam Study. The Journal of Nutrition, November 1, 2004, Vol. 134, no. 11. 3100-3105. http://jn.nutrition.org/content/134/11/3100.full Last accessed 6/19/2015. Most people get just enough Vitamin K from their diets to maintain adequate blood clotting. But NOT enough Vitamin K to offer protection against health problems including arterial calcification, cardiovascular disease, osteoporosis, various cancers and brain health problems, including dementia. The name Vitamin K comes from the German word “Koagulationsvitamin” where its role in blood coagulation was first discovered. Vitamin K is an essential vitamin. It is one of the four fat-soluble vitamins, along with vitamin A, vitamin D, and vitamin E. It’s found in leafy green vegetables, broccoli, and Brussels sprouts. Vitamin K and Vitamin K supplements come in several forms and can be confusing. To increase your levels of Vitamin K, it’s important to understand the differences. Vitamin K1: Found in green vegetables, K1 goes directly to your liver and helps you maintain a healthy blood clotting system; keeps your own blood vessels from calcifying, and helps your bones retain calcium. Vitamin K2: Bacteria produce this type of Vitamin K; it goes straight to vessel walls, bones and tissues other than your liver. It is present in fermented foods, particularly cheese and the Japanese food natto (the richest source of K2). Making matters even more complex, there are several different forms of Vitamin K2. MK-4 and MK-7 are the two most significant forms of K2 and act very differently in your body. MK-4 is a synthetic product, very similar to Vitamin K1, and your body is capable of converting K1 into MK4. It has a very short biological half-life of about one hour, making it a poor candidate as a dietary supplement. It remains mostly in your liver where it is useful in synthesizing blood-clotting factors. MK-7 is a newer agent with more practical applications because it stays in your body longer; its half-life is three days, meaning you have a much better chance of building up a consistent blood level, compared to MK-4 or K1. It slows down cardiovascular aging and osteoporosis, and prevents inflammation by inhibiting pro-inflammatory markers produced by white blood cells. MK-7 is extracted from the Japanese fermented soy product called ‘natto’. You get loads of MK-7 from natto. However, natto is generally not appealing to a Westerner’s palate (can’t tolerate its smell and slimy texture). You can also find Vitamin K2, including MK-7, in other fermented foods including some fermented vegetables. Certain types of fermented cheeses (Jarlsberg) are high in K2 but others are not. It really depends on the specific bacteria. You can’t assume that any fermented food will be high in K2. Besides broccoli, Brussels sprouts and leafy green vegetables (kale, mustard greens, collard greens, raw Swiss chard, spinach), other foods high in Vitamin K include beef liver, pork chops and chicken, prunes and Kiwi fruit, soybean and canola oil. Dosage: Although the exact dosage of Vitamin K is yet to be determined, one of the world’s top Vitamin K researchers, Dr. Cees Vermeer recommends between 45 mcg and 185 mcg daily for normally healthy adults. since it is fat-soluble and won’t be absorbed without it. This article is based on Dr. Mercola’s article, New Study Shows Evidence That Vitamin K2 Positively Impacts Inflammation. One of the easiest ways to increase your level of Magnesium is by applying topical Magnesium Oil. One benefit is it doesn’t cause loose bowels or diarrhea like oral tablets can. And it’s handy. It comes in a spray bottle. This advice comes from Patti, who prefers Magnesium Oil to oral tablets. She uses it for muscle twitching. When that happens, she starts her nightly application routine. She uses four sprays of Life-Flo Pure Magnesium Oil ($10) on each lower leg and massages it in. This ensures a large area for absorption. A total of eight sprays is equal to about 100 mg of topical magnesium. You can wipe off in 20 minutes, but she just showers it off in the morning. (She continues this for 6 weeks or more to rebuild her magnesium levels). A 8 oz. bottle lasts 3–6 months. ♥ ‘Natural’ Supplements for a Healthy Heart. Magnesium deficiency is central to creating conditions in the heart that cause Atrial Fibrillation. Therefore, anyone in A-Fib is almost certainly magnesium deficient. Why? It’s now almost impossible to get adequate amounts of magnesium from our diets. The trap for those who work hard at improving nutrition and supplements is they feel like a failure if they can’t stop their A-Fib with natural means alone. They keep trying one thing after another for years while avoiding an expert’s opinion about an ablation procedure. But trying natural remedies for A-Fib shouldn’t be an ‘either/or’ decision. We should use every tool possible to put the ‘A-Fib genie back in the bottle’. We should use every tool possible to put the ‘A-Fib genie back in the bottle’. The best approach is to combine an expert ablation procedure with permanent dietary improvements (including heart healthy nutrients and supplements) while also addressing any appropriate life-style changes (i.e., for high-blood pressure, sleep apnea, diabetes and obesity). For someone who has just developed A-Fib, try to get out of A-Fib ASAP. It goes without saying that it’s not healthy and feels terrible to have A-Fib attacks. To learn more about combining ‘tools’: go to our Frequently Asked Questions: FAQ Mineral Deficiencies and Supplements and my two articles ‘Natural’ Supplements for a Healthy Heart and Reader With A-Flutter Advises Two Lifestyle Changes. Taking warfarin to manage your increased risk of clots and A-Fib stroke? Have you been told to avoid foods with vitamin K to prevent excess clotting? To separate the facts from the myths about warfarin and vitamin K, take our 5 question quiz. 1. True or False: Warfarin and vitamin K actually work against each other in your body. True. Vitamin K helps your blood clot. Warfarin makes your blood clot more slowly. Your INR level is monitored to keep them in balance. 2. True or False: When taking warfarin, you should limit foods with high levels of vitamin K like dark, leafy greens. False. You don’t need to avoid foods with vitamin K. The key is to consistently maintain your daily level of vitamin K.
Don’t confuse vitamin K with the K on the periodic table for potassium. One’s a vitamin, the other is a mineral. 3. True or False: Vitamin K information is not included on most packaged food nutritional labels. True. So it’s often hard to determine the amount of vitamin K in your food. 4. True or False: To be safe, it’s better to maintain a low level of vitamin K in your diet. False. Don’t avoid vitamin K foods. Vitamin K is an important nutrient especially for bone strength, brain function and cardiovascular health. 5. True or False: A vitamin K supplement may actually help stabilize your INR levels. True. Some experts suggest that a low-dose vitamin K supplement (50-150 mcg/day) may help stabilize fluctuations in INR. Safety first. When on warfarin, don’t make any changes to your vitamin K intake without first talking to your doctor. If you and your doctor decide that you can increase your vitamin K intake, the key is to be consistent on a daily schedule. If consumption of vitamin K does affect your INR, your doctor can always adjust the warfarin dosage. For a practical reference about foods with vitamin K, check out the online ‘Vitamin K Finder’ at the ptinr.com website. Determining whether herbs, vitamins, and other over-the-counter dietary supplements can be helpful or harmful to you can be challenging. Our favorite resource is the About Herbs database at the Memorial Sloan Kettering (MSK) website. The database is continually updated and managed by a pharmacist and a botanicals expert with assistance from other MSK Integrative Medicine Service experts. Use the web-based service, or the About Herbs app that’s compatible with iPad, iPhone, and iPod Touch devices and other mobile devices. ♥ Or go to the web-based version. If you are using a dietary supplement, keep your doctor or other healthcare professional informed. Why? The active ingredient in the product could interact with—increase or lessen—the effect of other medicines you’re taking. It’s not a pill, nor a medication. Magnesium is the ‘magic’ pill that improves by 34% your chances of living a long, healthy life—a mineral naturally present in many foods. Magnesium is important for anyone with a high cardiovascular risk (including patients with Atrial Fibrillation). Insights come from researchers in Spain who carefully monitored the diets of 7,216 men and women between the ages of 55-80 (an age range more likely to develop A-Fib). The people in the highest third of magnesium intake (442 mg/day) were 34% less likely to have died from any cause over a five-year period. And they had a 59% reduced risk of cardiovascular mortality, plus a 37% reduction in cancer mortality. The best answer may depend on whether you are taking medication, on the specific supplement and/or on your personal life style. Read the supplement label. Some are fairly specific, i.e., “with or without food”, or “with food” or “on an empty stomach”; or specific time (morning or bedtime) or in divided dosages. Make notes for each supplement. Download and use this FREE form to help you keep track of everything. If you have diabetes, hypertension or heart disease, first talk to your doctor or pharmacist. Combining supplements with prescription medications, can produce unexpected or life-threatening results. They may offer advice specific to the combinations of your meds and supplements. • Taking a single dose multi-vitamin? It’s best to take it in the morning when nutrients are depleted and with or near breakfast so it’s broken down, then digested with the food. • Vitamin D is best absorbed after your biggest meal, usually dinner, averaging 56 percent greater boost than those who take it without food. • Calcium supplement, don’t take along with a multivitamin containing iron. The calcium may interfere with the iron’s absorption. • Magnesium may be best taken in the evening, since Magnesium may support sound sleep. On the website Healthy Directions, Dr. David Williams offers advice about the best times to take vitamins. He lists specific vitamins and supplements and organized them into three groups, those that should be taken before meals, with meals, or in-between meals. See his article for specifics, The Best Times to Take Your Vitamins. For reliable, unbiased research and information on specific vitamins and supplements, we recommend these three sites (in order or preference). None of the three sell supplements (or anything else). They just offer information on vitamins, herbs, natural products and supplements. 3. The ‘Dietary Supplement Label Database’ at the U.S. National Institutes of Health. You may need to adjust your supplement taking to accommodate work or school demands, family schedules, etc. For example, if you work the swing shift, your “morning” dose may need to be 1 pm, and your ‘evening’ doze may need to be at 2 am. Or, if you often skip meals during your work day, taking equally divided doses may become erratic. So, it may be better taking your doses before you go to work. For optimum benefit, it may take some effort to work up your supplement schedule. But you don’t have to obsess about it. Since these are ‘natural’ substances (vs. prescription drugs), you usually don’t have to be overly careful about when you take them. What’s important is do try to be consistent from day to day. After you work out your schedule, consider using a vitamin/supplement organizer. Check out My Search for the Best 7-Day Medicine/Vitamin Organizer. For more on where to research specific vitamins and supplements see, FAQ Minerals Deficiencies: Reliable Research. Can You Suppress Your PVCs and PACs? Are you one of the many A-Fib patients who also have PACs and PVCs? Are your PACs more than just annoying? Do your PACs become more frequent and trigger an A-Fib attack? Perhaps you’re thinking if you reduce these extra beats and palpitations, you may be able to reduce your A-Fib episodes. So, what can you do? PAC and PVC stands for Premature Ventricle Contractions and Premature Atrial Contractions. In extreme cases where the extra beats are very disturbing and damage one’s quality of life, Electrophysiologists (EPs) can perform an ablation for them similar to an ablation for A-Fib. But this is a specialized procedure that not all EPs perform or are willing to perform. • L-carnitine: A derivative of the amino acid lysine which helps to turn fat into energy. It promotes energy metabolism and enhances cardiac function. Some consider it the single most important nutrient in cardiac health. It reduces PVCs. Dosage: Daily: 750-2000 mg of L-Carnitine Fumerate (250 to 500 mg three to four times a day). • Coenzyme Q10 (Ubiquinone): A naturally occurring enzyme, part of the quinone chemical group, that is found in every cell in the body. It produces energy in the mitochondria and energizes the heart. 95% of the body’s energy is generated by CoQ10, which generates energy in the form of ATP. It prolongs the action potential and helps maintain sinus rhythm. It improves heart rhythm problems. Dosage: 100-300 mg daily in divided doses with meals. • D-ribose: A five-carbon sugar that is a regulator in the production of ATP. The only compound used by the body to replenish depleted energy stores. Ribose increases tolerance to cardiac stress, improves exercise tolerance and physical function, provides cardiac energy needed to maintain normal heart function, increases cardiac efficiency, lowers stress during exercise, and maintains healthy energy levels in heart and muscle. Dosage: Daily: 7-10 grams of Ribose powder. Take in divided doses with meals or just before and after exercise. • Magnesium: A vital mineral used by the enzymes that make energy synthesis and recycling possible. Adequate intracellular magnesium is essential to normal tissue and organ function. Low magnesium is associated with cardiac abnormalities, fibrillation, and vascular and muscle spasms, and is seen in cardiac failure. Read the research in my article, Premature Atrial Contractions (PACs) Predict A-Fib. Read John’s personal A-Fib story, PVC-Free After Successful Ablation at Mayo Clinic. Use our A-Fib.com portal link to Amazon.com to get your copy of Dr. Stephen T. Sinatra book, The Sinatra Solution—Metabolic Cardiology. 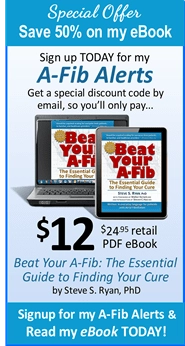 When you use the A-Fib.com Amazon.com link, we receive a small commission on each sale, at no extra cost to you. We apply it toward the monthly publishing costs of this website. Bookmark this link and use every time you go to Amazon.com. 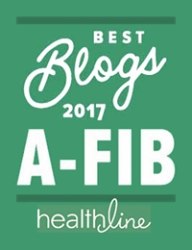 While not considered “A-Fib specific” like your medications, these minerals and supplements may improve overall heart health and thereby help your Atrial Fibrillation. For a detailed discussion of these seven nutritional supplements, see our article ‘Natural’ Supplements for a Healthy Heart. To get you started choosing brands, tablet size and forms of each supplement, we offer you 2 brands that meets our requirements. Coenzyme’s ability to energize the heart is perhaps its chief attribute; improves heart functions and heart rhythm problems. Coenzyme is a naturally occurring enzyme and plays a key role in producing energy in the mitochondria. “Ubiquinol” is a more readily absorbed form. L-Carnitine is a vitamin-like nutrient; a derivative of the amino acid lysine which helps to turn fat into energy. Considered by some to be the single most important nutrient in cardiac health. It reduces the incidence of cardiac arrhythmias and premature ventricular contractions (PVCs). Essential fatty acids like EPA and DHA are considered by some to be natural defibrillators, lessening the incidence of cardiac arrhythmias and A-Fib. Krill Fish Oil 1000 Mg; Essential Fatty Acids (EPA and DHA) make blood platelets less sticky, less likely to form clots (cause of strokes). Some prefer Krill oil to fish oil as it’s exacted from organisms living in pristine deep-water seas. Ribose increases tolerance to cardiac stress, lowers stress during exercise, and maintains healthy energy levels in heart and muscle. The heart’s ability to maintain energy is limited by one thing—-the availability of Ribose. Note: Mineral supplements may interfere or interact with your prescription medications, so always consult your doctor before adding any supplements to your treatment plan. Don’t expect a lot of support from your doctor. Unfortunately, a great number of doctors are not well versed in recommending or supervising nutritional support. Quite often, they may dismiss your inquiries about nutritional supplements. You may need to work with (or educate) your doctor to determine the benefit of supplements for your A-Fib health. For an extensive discussion about mineral deficiencies, see our Treatments page: Minerals Deficiencies. A deficiency in Magnesium and Potassium can force the heart into fatal arrhythmias. Most A-Fib patients are lacking in both minerals. Magnesium (Mg) is needed for proper muscle, nerve, and enzyme function. Lacking in most diets, it’s often necessary to take a magnesium supplement over several months to restore levels. A-Fib patients are often deficient in Potassium (K), as well In fact, a deficiency of magnesium can lead to potassium depletion. Potassium is essential for normal nerve impulses and muscle function and maintaining normal cardiac function. These are the Mg and K products I recommend (and use) along with a great book on magnesium. I’ve also added two Bonus Videos. These products are available from many online sources. You can see this ‘Wish List’ on Amazon.com. 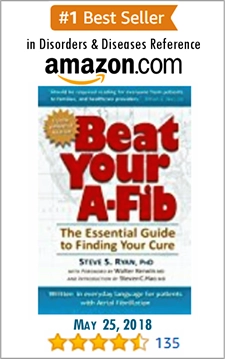 (Note: Use our Amazon portal link, and your purchases help support A-Fib.com.) For recommended dosages, go to Treatments/Mineral Deficiencies. (200 Mg Elemental) 240-Count tablets. One form of easily absorbed magnesium is Magnesium glycinate a chelated amino acid. Look for the label ‘Albion Minerals.’ This is a patented process designed to limit bowel sensitivity. 3. Ancient Minerals Magnesium Oil, 8 oz. If oral magnesium causes bowel sensitivity (loose stools), an alternative is magnesium oil which bypasses the gastrointestinal tract. Spray on the skin and massage in. After 20-30 minutes, you can wipe off any powder residue (salt) or just jump in the shower! Eight sprays delivers approximately 100 mg of magnesium to the skin. Similar to Epsom salts (Magnesium sulfate), the molecular structure of Magnesium Chloride is different and is much more easily absorbed into the body. Soak for 20-30 minutes in a bath with 2 cups of bath flakes. Can be used in conjunction with magnesium tablets. Any brand will do. Comprehensive book on the importance and helpful benefits of magnesium as well as just what a magnesium deficiency causes. Easy to read with organized sections with dosing recommendations. Best seller on Amazon.com with over 600 reviews. 2. The Importance of Balancing Calcium and Magnesium. To read more about mineral deficiencies and how to use these products and recommended dosages, go to Treatments section on Mineral Deficiencies. Caution: Consult with your doctor before adding any supplements to your treatment plan. “I was diagnosed with A-Fib about 18 months ago, but as it turned out, I have PAC’s. Of course I was told that these PACs will eventually turn into A-Fib. But I believe that irregular heartbeats, even A-Fib, can often be caused by a magnesium deficiency. After about a year on ReMag, my heart is mostly in NSR. It works! 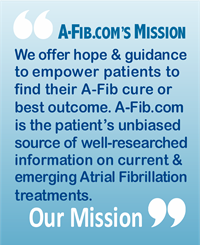 Dr. Carolyn Dean has written an eBook about A-Fib and the magnesium connection: Atrial Fibrillation: Remineralize Your Heart [July 2015]. The good thing about her liquid magnesium product, REMAG™, is that you can take a therapeutic dose without the laxative effect. I was taking 900 mg daily but now I need less. I take about 600-750 daily. I’m thankful to Dianne for sharing her A-Fib success story of replenishing her Magnesium levels. Magnesium is useful for many muscle-related ailments and has rightfully been called the ‘miracle’ supplement. Email us what’s working for you. • Doctor’s Best High Absorption Magnesium (200 Mg Elemental), 240-Count (2-4 tablets a day). On Amazon.com that’s $13.84 for a 2–4 month supply (includes Free shipping for Prime Members). About $3.50 to $7 a month. • Magnesium oil; Spray and rub into the skin; examples: Ancient Minerals Magnesium Oil and Life-flo Pure Magnesium Oil; 8 oz spray bottle lasts about 4 months. About: $2 to $4 a month. • Epson salt (magnesium sulfate); Any brand in bulk. $1.50 to $4.50 a pound. Less than $1 a bath. Dissolve 1 to 3 cups (or three handfuls) in full tub bath and soak for 30 minutes. These Magnesium products can be used in tandem to maximize your Mg absorption. Read more about Atrial Fibrillation and Mineral Deficiencies in our Treatments section. Be patient when supplementing Magnesium. It takes three to six months, or more, to replenish your depleted levels of Magnesium. INTERVIEW: Dr David Snow, host of Doctor Health Radio, talks with Steve S. Ryan, PhD, publisher of A-Fib.com, about magnesium and potassium deficiencies, both common among A-Fib patients; how ‘calcium overload’ can actually bring on Atrial Fibrillation; other supplements to promote a healthy heart; and a few warnings for A-Fib patients. Video Format: radio interview with lower third graphic titles. Length: 5:27 min. Click to listen in. VIDEO LIBRARY: We have loads of A-Fib-related videos in our Video Library. For the reader who learns visually through motion graphics, audio, and personal interviews, these videos are organized loosely into three levels: introductory/basic, intermediate and in-depth/advanced. See our video library for more videos featuring Steve S. Ryan, PhD. Are you taking the blood thinner warfarin to manage your risk of clots and A-Fib stroke? Have you been told to avoid foods with vitamin K to prevent excess clotting? Want to know the facts about warfarin and vitamin K? Take our 5 question quiz to separate the facts from the myths.